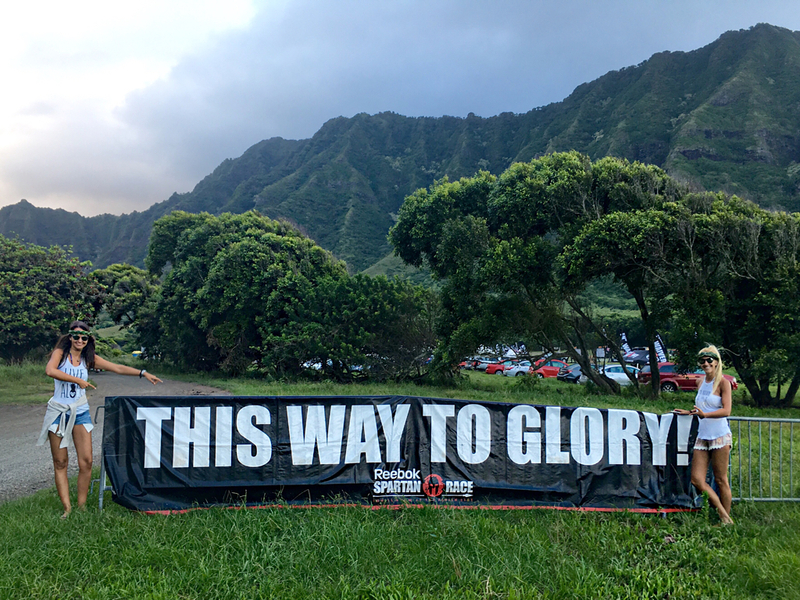 Spartan Ultra Beast Hawai’i 2016: THIS WAY TO GLORY! The Spartan Ultra Beast most of the times is twice the Beast course and therefore a marathon distance obstacle race with around 27 miles / 42 kilometres, but even single loops exist. The 2016 Spartan Ultra Beast Hawai’i took place on 13th August at Kualoa Ranch on O’ahu’s North Shore. O’ahu is Hawai’i’s main island with the capital city Honolulu and therefore is easy to reach via airplane from all over the world. We had to show up at the festival area the evening before the race to pick up our bib numbers, race bags and all that stuff and when we arrived, a barbeque with a traditional hawai’ian show took place. The BBQ was funny to watch and as the Spartan Race Hawai’i is a Trifecta weekend, there were already many racers with medals from the Friday Sprint and Hurricane Heat. And we weren’t alone: Three friends and team members of our OCR team Munich Elite Warriors also made their way to Hawai’i! At 6am, the starting shot was fired and we were off to a merely 44k race. The first ~8k took us through a beautiful valley with great views of the ocean and surrounding mountains. We had everything, from burning sun to pouring rain and the course got muddier every second. There were many straight uphill climbs in the rainforest part pf the course and we had to hold on to trees, branches and ropes to not slip back every second step. The obstacles were almost the same as in Europe, except they were somehow “bigger”: The Bucket Carry was heavier and longer, the rope climb was higher (9m! ), but thankfully we were able to deal with most of the stuff. Fun on the course, even during the heat! 9 meter high Rope Climb! After roughly 5 hours we had completed the first round and reached the transit zone, where we had dropped bags with supplies and a headlamp plus glowsticks for the second round. After a short rest we were off again, knowing that we had to do the whole thing again… The second lap felt easier to run, but we had to do a lot more penalty burpees as we failed to complete all the obstacles from the first round and that time, the course was even MUDDIER and the rainfall heavier – and there were the Super and Beast Runners on the course as well, which meant quite some queuing. Luckily we weren’t too exhausted and didn’t have to slow our speed down, so in the end we completed the course in 11 hours and 14 minutes withour any hazzle or struggle. The feeling while crossing the Finish Line is always awesome, but this time it was really special! We made it: SPARTAN ULTRA BEAST FINISHER!! !